In Baklavas's original hybrid monoblock amplifier, the Aelius, the first gain stage was a new old stock (NOS) C3g pentode tube operating in single-ended mode and transformer-coupled to the output stage. The Aelius II added an input transformer, then newly developed, that permitted balanced input operation and the use of longer interconnects. The input stages of both Aeliuses featured tube rectification. Obviously, the quality of transformers is key to power-amp designs from both Music Reference and Ypsilon. Modjeski offers an upgrade to a hand-wound output transformer, and Ypsilon specializes in designing and manufacturing transformers. Ypsilon's new Hyperion monoblock ($93,000/pair), like the less powerful Aelius II, is a hybrid design with two gain stages. The first stage uses a single low-impedance dual-triode tubeeither a 6H30 or a 5687 will work. The Hyperion comes with the formera Sovtek 6H30 Pibut to allow tube-rolling, there are separate sockets for the two tube types, which have different pinouts. Also included is a 6CA4/EZ81 rectifier tube. The input-stage tube's bias is fixed. Its dedicated negative power supply includes a custom C-core input transformer, wound with silver wire, that eliminates the DC bias voltage bypass and produces a true balanced input. The two halves of the input tube are paralleled via separate coil windings to provide independent paths for each half's bias current. The interstage transformer is a step-down that couples the input triodes to the output devices and includes phase-splitting windings that drive each pair of MOSFET output-stage devices in opposite phase to each other. Using the interstage transformer, Baklavas avers, lowers the tube's output impedance, which better drives the output stage while providing a perfectly balanced, floating signal. Not using the transformer, he says, would require at least two additional gain stages plus power supplies, making for a more complex circuit. He prefers to keep things as simple and elegant as possible. As with anything in life or audio, there's a drawback to such a design: the difficulty of producing a transformer with wide bandwidth and integrating it into a solid-state circuit requiring unconditional stability. But transformers are Baklavas's game, and the time I've spent with his trannies has convinced me to unconditionally trust them. The Hyperion's output stage is biased in class-A for its first 100W into 8 ohms, and can output a total of more than 370W into 8 ohms, 650W into 4 ohms, and 1150W into 2 ohms. Each of its two stages has its own power-supply transformer, and both the tube input and solid-state output power supplies use inductive chokes, built in-house, for filtering. A great deal of attention was reportedly paid to the design, construction, and materials of the cores of these power-supply transformers, to minimize mechanical, magnetic, and electrically induced noise. In addition to the chokes, the power supply incorporates 112,800µF of capacitance to keep ripple voltage negligible at all power-output levels. Internal connections are made with Ypsilon's own specially drawn silver wire, coated with Teflon. As in the Aelius, the Hyperion's output "floats"neither the plus nor the minus terminals are grounded. The amp is well protected using a "crowbar" circuit. There's no output relay, though there is a circuit breaker on the rear panel, and inside the Hyperion's case is a fuse for the input transformer. If the output shorts, or sees a load of less than 1 ohm, or there's excessive DC offset, the Hyperion automatically shuts down. Once the problem is fixed, turning the amp back on restores output. Each Ypsilon Hyperion weighs 209 lbsmoving and unpacking the pair of them was a multiperson operation. The installation of a lawn-sprinkler system chez Fremer the day the crates arrived provided the necessary manpowerafter the guys had washed their hands of topsoil. The Hyperions arrived having been burned in for only 100 hours. I found that, even after they'd been broken in, they required at least an hour of play to develop their full potential. For the first hour or so, they sounded somewhat dynamically constricted and not entirely transparent. I first ran a long pair of TARA Labs Zero balanced interconnects between my darTZeel NHB-18S preamplifier and the Hyperions. A few weeks later, I swapped out the darTZeel for the Silver edition of Ypsilon's PST-100 Mk.II line preamp. So often, when swapping out familiar gear for new, there's a period during which my brain accentuates or exaggerates the differences between the old and new sounds. At such times the new can at first seem like an uninvited guest disrupting my system's musical harmony. That wasn't the case here. Sure, it took me some time to get used to the Hyperion's sound, which was richer, fuller, creamier, more full-bodied than that of the darTZeel NHB-458 monoblocksbut that sound was also immediately familiar because it meshed well with the sound of Ypsilon's VPS-100 phono preamplifier. That model arrived here for review some nine years ago and never leftexcept briefly, to be upgraded to its Silver edition (footnote 1). Big hybrid amps running in class-A for the first 100W are good company during a record cold snap! No doubt the single tube in the Hyperion's signal path subtly greased the musical proceedings with a smooth yet transparent overlay of richness. Having become acclimated in recent years years to the sound of the darTZeel NHB-458, which is less generous in the upper bass and lower midrange (detractors of solid-state designs might describe its sound as "thin") and is faster in the transient realm (detractors might say "overly and unrealistically sharply drawn"), the gross distinctions between these two great performers were easily audible for the first week or so of listening. But even while the contours of the new sound were still easily definable and the differences between the two amplifiers were still clear, the Hyperion's "additive" quality wasn't immediatelyor ever, for that matteridentifiable as what's usually thought of as tube sound, but rather as a subtle harmonic and textural generosity that I think most listeners would find very pleasing and desirable, regardless of on which side of the tube/solid-state divide they stand. At the high performance level of my reference amps, and because of what I'd assumed I'd hear from the Hyperions, based on my experience with other Ypsilon gear, I expected to draw equal amounts of pleasure from both, and hear no new revelations. Because of the immediately obvious added harmonic and textural richness, subtle though it was, once I'd begun listening critically, I found myself playing mostly classical and jazz. I'd received in the mail a two-LP set of pianist Daniil Trifonov, then 21 years old and the recent winner of the 14th International Tchaikovsky Competition (among many other awards), performing Tchaikovsky's Piano Concerto 1, with Valery Gergiev conducting the Mariinsky Orchestra. Disc 2 features Trifonov playing mostly Schubert songs, arranged for solo piano by Liszt (Mariinsky MAR0530-LP). This is a prize-winning soloist and a world-class orchestra, well recorded in a fine-sounding hall. Whether on the vinyl (which had what sounded like a few "non-fill" problems) or the free 24-bit/96kHz FLAC download, the balance of direct to reflected orchestral sound was, for me, ideal, and the perspective was positively grand, à la recording engineer Dr. Keith O. Johnson. Not everyone likes this kind of somewhat distant sonic drama, but it went perfectly well with Trifonov's grand, sweeping, romantic playing, and left enough room for Gergiev's dramatic orchestral swells not to overwhelm the soloist. Footnote 1: I reviewed the VPS-100 and VPS-100 Silver in "Analog Corner," in the August 2009 and March 2011 issues. Now I've seen everything- A tube rectifier in a SS behemoth. Tube rectifiers are loved by guitarists for the sag they exhibit, something I assume would not be welcomed in a SS audio amp. Feel free to correct me if I'm wrong, and explain to me why. To the best of my knowledge, the tube rectifier is used in the power supply for the front-end circuit, not for the output stage. ..given that a 6CA4 rectifier is capable of a "whopping" .15 amp of current. But it still begs the question why. A solid state rectifier would have worked perfectly here, and without the vagaries created by tube wear. Given the overall design and resultant performance of this amplifier, the "why" about the tube rectifier is dwarfed by other, far more serious "why's" about other parts of the circuit. The circuit of this amp resembles a design by Fisher from the early 1960's, using a dual power pentode to drive an interstage transformer, followed by a set of germanium output transistors. It too performed rather poorly, but it was only used in Fisher's stereo consoles where highest performance wasn't required. your comment of concern over the linear rise in distortion with output power set me thinking. A simple non-linear transfer function generates harmonics that increase proportionately more than the fundamental increases as the input is raised, i.e. for every dB increase in the input (or output below compression) the second harmonic distortion (2HD) will increase by 2dB, the third harmonic distortion (3HD) by 3db etc (for as many terms that describe the non-linearity). Plotting these you get a slope of 1x for the fundamental, 2x for the second harmonic & 3x for the third harmonic when plotted in dB (or on log-log) axes. If you plot the difference between the fundamental and the harmonic you get a 1x slope for 2HD (2x-1x) and a 2x slope for 3HD (3x-1x). This leads to the "intercept point" linearity metric used in radio design. Applying that to your distortion vs power plots, which are not in dB but are on log-log axes: a decade change in output power is 10dB and the THD percentage represents the difference between harmonic and fundamental with a decade change being 20dB (assuming the measurement system is reporting the harmonic/fundamental voltage ratio, not the power ratio). Fig 3. fits a 1x slope perfectly meaning THD is dominated by 2HD (as proved by Fig.7). Looking at a couple of other examples, your measurements of the Lamm M1.2 Reference also fit a perfect 1x slope. 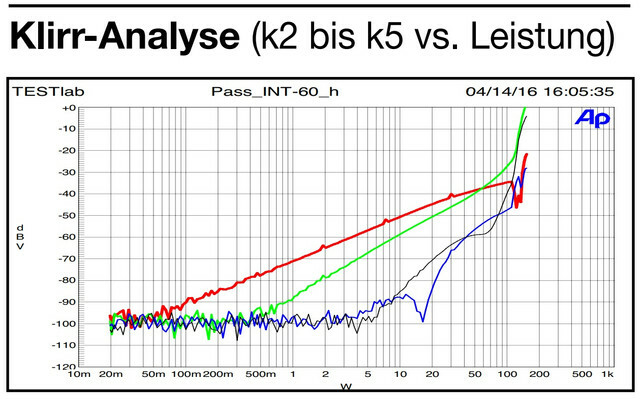 The Audionet Max trends to a perfect 2x slope at higher powers (at least into 8 ohms) so 3HD must dominate. The Pass Labs XA60.8 has a 1.25x straight line suggesting 2HD & 3HD are dominating but do not behave quite as theory suggests possibly due to moderate global feedback. And then there are many amplifiers with weird and inexplicable shapes to the THD vs. output power plot that may indicate transfer functions that change with power level, cross-over distortion &/or high levels of global feedback. I think "concern" is appropriate for the absolute level of the distortion from the Ypsilon but I find the linear slope itself comforting in that the amplifier behaves with a simple second order transfer function. Perhaps such a characteristic is akin to natural sounds and our brains expect the levels of harmonics to follow the 1x, 2x etc slopes as volume changes. Perhaps you could have the Audio Precision system plot individual harmonic levels instead of THD to see if there is a better correlation to subjective preference than a % THD number. ... lead you to conclude about the performance of Benchmark AHB2 amplifier? Why don't you write down the equation? A simple non-linear transfer function generates harmonics that increase proportionately more than the fundamental increases as the input is raised, i.e. for every dB increase in the input (or output below compression) the second harmonic distortion (2HD) will increase by 2dB, the third harmonic distortion (3HD) by 3db etc (for as many terms that describe the non-linearity). If the transfer function is simple, please write it down and show how you derived it. For many of us, it is easier to follow equations than prose. Thanks in advance. ...you may wish to kindly explain, how you can even talk about a transfer function (defined for linear systems) in the context of distortion, which is a nonlinear phenomenon. Innovative thinker you are, dear sir. THta's a great point. The more complex the transfer function polynomial, the less it resembles how real sounds change with increased spl. I do show the harmonic signature of an amplifier's distortion in our reviews, but plotting how the individual harmonics increase with increasing output level might indeed be insightful. The German Stereoplay magazine has this type of measurement graph for amplifiers (done with an AP), they show how the individual harmonics vary with power output until clipping. One thing rarely –well, never– taken into account is that the harmonic structure of most natural instruments, let alone amplified, significantly changes as volume increases, with higher harmonics becoming dominant at louder levels (http://www2.siba.fi/akustiikka/?id=42&la=en). That's right people, natural instruments can scream as hell. Therefore an ideally linear power amplifier would faithfully reproduce a live session only at the same level it was originally recorded while in the meantime imprinting that fixed harmonic structure to all other volume levels indiscriminately. Of course no one between us cares about the original loudness level (some engineers do though); if it's loud enough, which is usually the case especially on real-time live sessions, then its high-pitched pattern will be projected to all volume levels distorting natural dynamics and giving a distinct shouting quality to every cry or whisper, as unnatural as an adult-size version of a child. Let’s not even mention the usual case where a typical feedback-based amplifier adds its own higher-harmonic distortion signature to the initial scream accumulating insult to injury. A decent 2nd-dominated distortion pattern compensates more or less for the aforementioned discrepancy mellowing down the recorded signal in advance just in case, sometimes unnecessarily so. Hyperion measures actually well given its uncommonly high-powered open-loop hybrid design. Tailored? Maybe – not so bad though considering that the alternative is nothing but some one-size-fits-all attempt to "neutrality", despite whatever audio gurus want us to believe. If the system is completely linear K2=0 & K3=0 and K1 is the gain. If K2>0 then there will be some second harmonic and if K3>0 there will be some third harmonic (and so on for any harmonic). When you multiply such an equation by a sinusoidal input (Vin*sinF) you get (Vin*sinF)^2 that becomes a Vin^2*sin2F term using trig identities and similarly (Vin*sinF)^3 becomes a Vin^3*sin3F term. The levels of the harmonics vary with the input squared or cubed etc and when plotted on log vs log axes (or dB vs dB) you get straight lines with slopes of 1x for the fundamental at frequency F and slope of 2x for the second harmonic at frequency 2F etc. Radio engineers use this analysis to generate something called a "third-order intercept point" using the relationship of the slopes to predict distortion for any given power level based on a single metric (at very high frequencies amplifiers do not have enough gain to allow the use of much feedback so you are stuck with their inherent non-linearities). Intercept Point metrics have been proposed for audio in the past though I doubt it would be very useful but I was reminded of the concept when viewing Ypsilon THD plot as it fits the straight line theory nicely. But most of the amplifiers that JA has measured do not. Ortofan - JA's results for the Benchmark amplifier suggest the harmonics are at or below the minimum measurable levels. Benchmark are an objectivist company so I would expect them to use as much feedback as possible to minimize distortion and am not surprised to see the result. Whether high feedback is good audiophile goal is an on-going debate. Feedback does change a large but simple non-linearity into a much smaller but more complex linearity and most of the THD plots I looked at are difficult to interpret. I do not envy JA trying to add some commentary around each set of results. One that I was interested in is the PS Audio BHK Signature power amplifier that has a tube input stage followed by a MOSFET ouptut stage, similar to both the Ypsilon and Lamm power amps. In videos on the PS Audio website both Paul McGowan and designer Bascom King talk at length about how important the input tube is to the sound of the amplifier but its presence doesn't show up in the THD plot in terms of a 1x slope due to second harmonic distortion. The BHK amp does have global feedback that has reduced the input tube's objective footprint to almost nothing so I am surprised that the tube's sonic footprint is still apparent. ok - I wondered if the harmonic generation from instruments follows the same slope relationship. That would explain why higher order harmonics go up more as the sound gets louder. But, as you suggest, whether it is best to have an amplifier with that same characteristic or have one which produces negligible amounts of distortion? Sorry, I am still a bit confused. Thank you for your clear explanation, but I’m still a bit confused. The way I was taught about the transfer function is as follows: it is the ratio of Laplace transforms of the output and the input. So, voltage (or amplitude, in general) is not even an argument in the transfer function. Rather, the argument is the (complex valued) frequency. Also, transfer functions in this sense cannot be defined for Non-linear systems. My guess is that we are using the same term for two very different functions. It's certainly true that, in the context of LTI systems, the transfer function is the Fourier (or Laplace) transform of the impulse response. Of course, there are no physical LTI systems in reality (there are no physical impulses for that matter) so all this formalism is just a very useful and convenient approximation for physical systems that are, over some limited domain, range and time, LTI. Nonetheless, I agree that transfer function for a non-linear system seems odd to me at first glance. Perhaps, in the pseudo-static case, transfer curve or transfer characteristic is more appropriate? I agree fully. While there are no real LTI systems “out there”, transfer functions are used when the system is close to linear. What our colleague described, is a sort of input-output correspondence that emphasizes non-linearity. I think we might be using a the same term in two contexts. He appears to be a radio engineer and transfer functions might be defined differently in that field. If I have used the term "transfer function" confusingly, mea culpa. If "transfer curve" is OK with you then what we are talking about is Vout/Vin measured at one frequency (1kHz). John measured the 1kHz gain as 26.4dB (20.2x) but that was taken for one value of input voltage. If the gain was 20.2x for all values of Vin then the "transfer curve", Vout vs. Vin, would be a straight line with a slope of 20.2x and there would be no distortion. In this case we would have Vout = K1 * Vin with K1= 20.2 and no second-order term because K2= 0. What actually happens is that the gain is not exactly 20.2x for all values of Vin and the plot of Vout vs Vin is not a straight line but is a very slightly bent line. 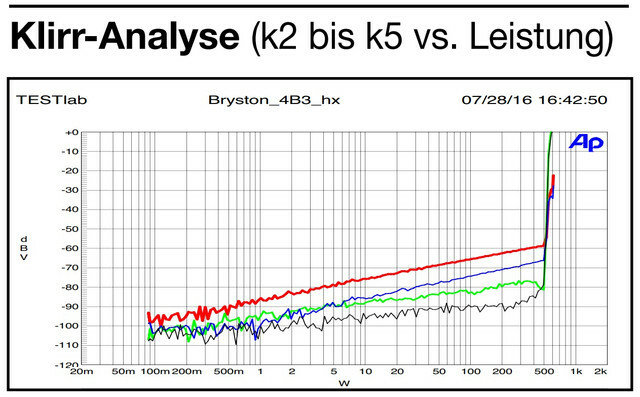 After a little manipulation of John's Fig.3 I calculated that K2 is actually 0.091 for the Hyperion amplifier. So, Vout = 20.2 * Vin + 0.091 * Vin^2. If you plot this function in a spreadsheet you will see that it looks pretty straight but is perceptibly bent compared to Vout = 20.2 * Vin. That very slight bending is responsible for the second harmonic. Now I see that you radio engineers use a different terminology. That is cool, but I still don't get your derivation (I know, I'm not a smart person, please have patience with me.). THD = f(Vout^2), that is, the THD is a function of squared(!) output voltage. In the first order of approximation, this relationship is equal to THD = gain^2 * Vin^2/R (Since in the first order Vout = gain * Vin). So, I don't understand how you got the linear term in your equation. I like to think of myself as an engineer of the world but it is interesting that different fields characterize distortion in different ways even though the non-linearity is the same bent transfer curve. Answering your questions has pushed me to the point where I have to write the whole analysis down for completness! I don't know if you can send PMs on this forum - if you can send me one and I will forward you the analysis when I have written it down. Otherwise I will find a way to make it accessible and post a link here.